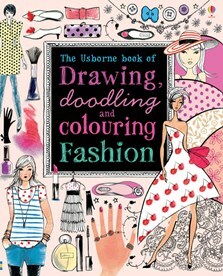 A fabulous book for anyone who loves drawing, doodling, colouring – and fashion! Stylish pictures invite you to decorate dresses, design fashion items, doodle hairstyles, colour in fabric designs and much more. A bumper book for all girls interested in fashion. The outlines are there - it's up to the reader to create their own masterpieces - doodle hairstyles and make-up, draw funky T-shirt designs, design Christmas party dresses and colour in patterns influenced by fabric designs, buttons and bows. It was so much fun! I got this for my younger sister and she really enjoyed it!